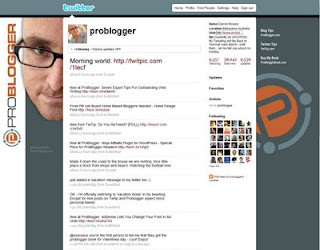 Yesterday, I received an email notification from Twitter telling me that Darren Rowse (the famous Problogger) is now following me on Twitter. I am already following his twitter page and know what it looks like. 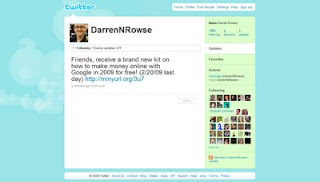 Darren uses "Problogger" as his twitter name whereas this guy used his full name "DarrenNRowse". When I checked a couple of minutes ago, he only had 4 followers. It has now increased to 18. Fake or spoof accounts, especially of celebrities and famous people, on Twitter is not new. Someone faked the Tibetian leader Dalai Lama sometime back, attracting more than 2000 followers in just a couple of days before it was finally suspended. just found out that the page has been suspended. i'm sorry, maybe my comment is not related to this post, but i was informed that on facebook we can put our blog feed, can you make a post bout that,i don't know how to do it.. I have been using the twitter to promote my website..I was looking for some information on it and your post really was very helpful.Thanks for the informative post..
Thx for the update. Actually this scammer did invite me to follow him. I will remove him from my follow list.